Within the Esdra estate agri-spa located in the Liri Valley, you will find a restaurant open to the public, not only to the guests of the estate. 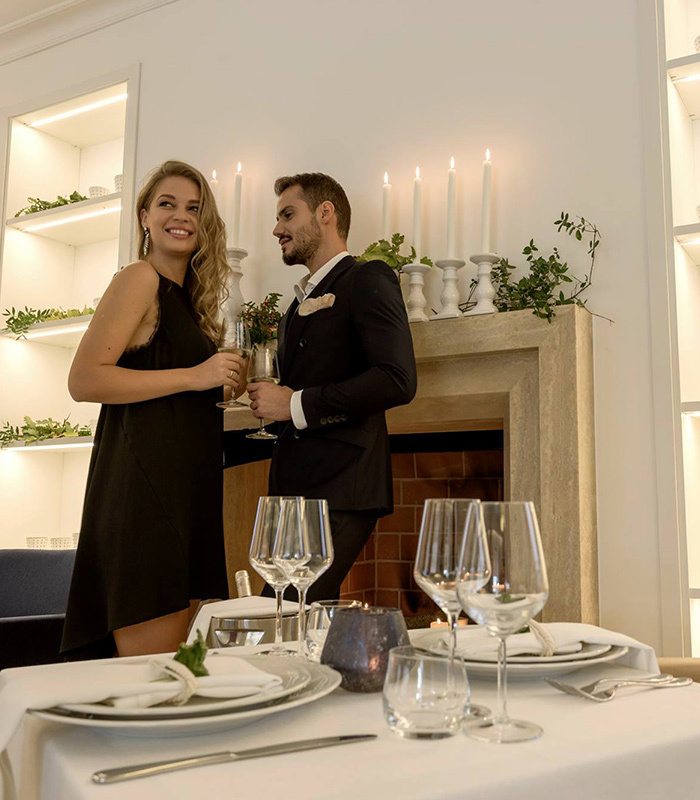 More than just a restaurant, here we have created a setting for you to enjoy a true multi-sensory experience, in line with the rest of the activities offered at the estate. From our indoor dining room which seats 30 people, or from our outdoor veranda overlooking the pool and the oak forest which seats roughly 60 people, you’ll have the opportunity to savour dishes that originate from a philosophy which brings to the forefront the products of our territory. Indeed, the ingredients used are all grown directly on our farm within a botanical garden managed only using traditional methods, while fully respecting the environment. Sustainable catering is one of the many strengths of the Esdra estate: our a la carte menu offers typical local dishes revisited and given a fresh creative twist by our renowned chef. With many years of experience in the field, he is able to beautifully enhance the flavors and aromas of each ingredient. Furthermore, each is grown in a specific manner, in line with its morphological characteristics: the fertilizers and the methods used derive from ancient cultivations, light years away from today’s intensive and industrialized agriculture. In this place embraced by nature, almost as a mother would her child, we make it possible for you to discover the best of our local and national culinary treasures, through the vision of sustainability and authenticity to be passed down for generations. To beautifully accompany each dish, our Liri Valley restaurant offers a wine list which consists of a selection of the most important local labels: the excellence of the Lazio region is the only choice. The quality, courtesy and professionalism of our staff, make up the frame of a gastronomic experience nothing short of first-class and to be slowly savored in an exclusive setting. At Esdra, typical dishes are reinterpreted, without ever distorting their true essence. We create a multi-sensorial dialogue where everything is connected. The sense of smell is inebriated by the perfumes, the sense of sight by chromatically impeccable dishes, the sense of hearing by the alternation of consistencies between soft and crisp, the sense of touch by the qualitative consistency of raw material and the sense of taste by the combination of all these, which yield to unique flavors to be tried without the slightest hesitation. In Ciociaria, where Tenuta Esdra showcases its beauty in what seems like a “world within a world”, gastronomy is a cornerstone of local culture. With our chef’s skills, dishes that have made our area’s history are given a second life, maintaining old clients while bringing those of tomorrow closer. Everything we do in our kitchen is done with a direct, passionate and cheerful approach, all the while choosing only the best KM0 in season products, which have always characterized our Agri-Spa’s philosophy. Our menu is entirely based on local KM0 products. All vegetables are grown on our lands and the meat comes from animals raised on our farm.